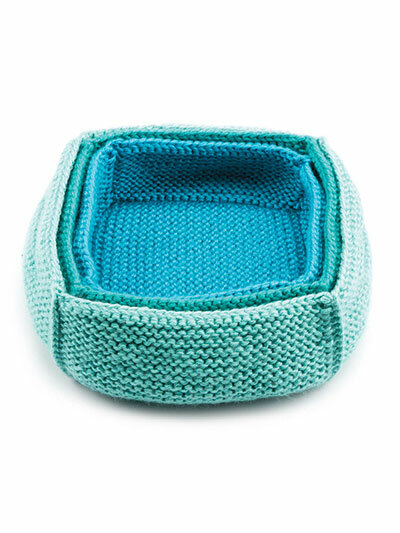 You'll love how quick these baskets are to knit, and how useful they are for storing your odds and ends! Knit with a total of 5 skeins of Premier® Yarns Ever Soft at a gauge of 15 sts and 30 rows per 4" using U.S. size 10 1/2/6.5mm needles and a size G/6/4mm crochet hook. This pattern was originally published in the autumn 2014 issue of Creative Knitting magazine. These baskets are knit in such a way that there are 28 loose ends per basket to weave in, and no real wrong side except for the bottoms of each baskets. And the suggested yarn is very soft. A stiffer yarn would yield a basket that better keeps its shape. 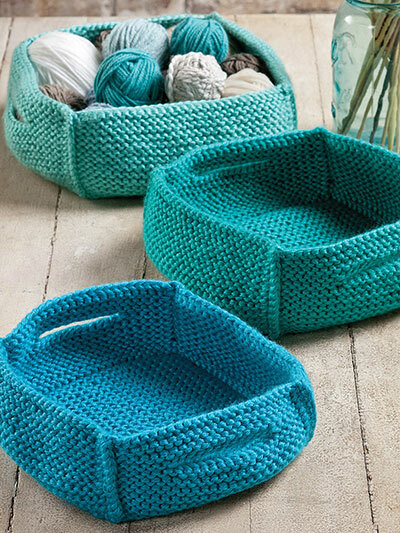 Love the looks of these baskets, and all knitted except the bind off and cast on for the handles, you can make any size. Anyone that has not knitted you can do these for they are easy.